Using easy to grasp concepts, Sams has created an original technique for creating an improvised environment. Using his “If-then” approach to space objects will allow you to systematically create an interactive world that spawns from a single thought at the top of the scene. This approach allows your mind to slow down and allows brilliant specificity to emerge. Through exercises, drills, and techniques, Sams will provide you with the tools to create an improvised world that you will be emotionally invested in. By investing in the world you will be more grounded and your nerves will calm allowing you to play more freely. In your improv, it is the difference between being a talking head and truly experiencing the story you are telling. Marcus Sams hails from San Francisco, Ca. where he is the artistic director of Moment Improv Theatre. He has performed improv since 2001, has been in 60+ national improv festival shows, has been taught by some of the greatest teachers of our time and has taught hundreds of students himself, from beginners to advanced. 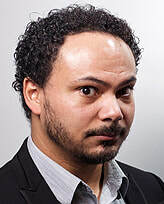 Marcus is a producer for the San Francisco Improv Festival, has taught for Endgames Improv, Leela, a multitude of improv festivals, and for Hass School of Business. Marcus believes that improv skills are life skills and that anyone can participate in this magical and transformative art form. Marcus has a systematic and heart-centric approach to improv that breaks down improv concepts and delivers usable tools to the working player. Marcus was originally trained as a stage actor and brings this respect for stagecraft and training to the improv world. He believes that improv is a craft and that once one learns the craft of improv, it frees them up to experience a deeper level of play. I am also the Artistic Director of the San Francisco Improv Festival.